New York, NY - Partners WildCRU and Panthera today announced that they are organizing and hosting a landmark summit for range wide lion conservation in 2016, in honour of Cecil the lion, whose death triggered a global outpouring of empathy and awareness for lions and their imperilled status. As the American talk show host Jimmy Kimmel said when he exhorted his viewers to support WildCRU's Hwange Lion Project, out of the sadness of the illegal death of Cecil can come good. The global roar for lion conservation that followed has created a unique moment – and potentially a historic turning point – for lion conservation. Seizing that moment, partners WildCRU and Panthera, the global wild cat conservation organization, are convening the Cecil Summit to grasp this new momentum in lion conservation, and inviting the foremost conservation experts from organizations throughout the lion conservation community to join us in a concerted effort to save the lion. Lions are in crisis. Because lions are uniquely visible to tourists there is a false impression that they are not endangered. The opposite is true: they are disappearing in plain sight. From an estimated population of 200,000 across Africa a century ago, and 30,000 a decade ago, as few as 20,000 lions may now roam free in the entire continent. Their numbers have been devastated by loss of habitat and wild prey, poaching, conflict with farming communities, unsustainable legal hunting, and emerging threats including the use of lion bones in traditional Asian medicine. Lions are being killed daily in Africa. Cecil was studied through the Hwange Lion Project, operated by Oxford University’s Wildlife Conservation Research Unit (WildCRU) and supported by Panthera, for eight years before being tragically killed outside Zimbabwe’s Hwange National Park. WildCRU is the leading university-based felid research and conservation centre in the world. Its partnership with the highly accomplished cat scientists of Panthera, who represent the most comprehensive effort of its kind in cat conservation, enable them and their multiple partners to achieve landscape level impact. To effectively implement strategies that stick, as exemplified by WildCRU's Hwange Lion Project and Panthera's Project Leonardo, they actively work with governments, park managers, landowners, local communities and NGOs to develop actionable solutions. 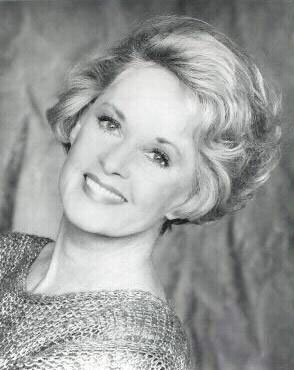 After a few weeks of filming The Birds with Rod Taylor, director Alfred Hitchcock told Associated Press reporter Bob Thomas, "Tippi Hedren is really remarkable. She's already reaching the lows and highs of terror". The former New York fashion model was making her debut as an actress in a starring role in The Birds, and such high praise from the enigmatic master of cinema shock and suspense was rare indeed. "Like a dormant volcano we know one day is going to erupt," Hitchcock described her. "Get a look at that girl, she's going to be good. I gave her the leading part in The Birds. It is a big part. I think Svengali Hitch rides again." In a cover article about The Birds in LOOK magazine (Dec. 4, 1962), Hitchcock continued to rave, "Tippi has a faster tempo, city glibness, more humor [than Grace Kelly]. She displayed jaunty assuredness, pertness, an attractive throw of the head. And she memorized and read lines extraordinarily well and is sharper in expression." Although the critics were perplexed by the "end-less ending" of The Birds, the movie, which premiered at The Cannes Film Festival, was a sensation earning over $11,000,000 in the first few months, and is now a classic. 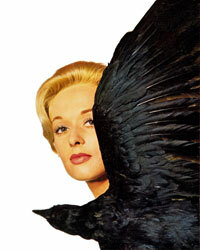 Saturday Review's Arthur Knight wrote, "Hitchcock's newest 'find', Tippi Hedren is a decidedly lovely blonde." Her performance in the film earned her a Golden Globe award. Camille Paglia, Professor of Humanities at the University of the Arts in Philadelphia and author of several acclaimed books about women in film, and The Birds (BFI Publishing, 1998), a critical analysis of the film, wrote, "It's so unfair that Tippi Hedren has never had the credit she deserves for the two films she did with Hitchcock. I think the reason critics did not take her seriously is because she is too fashionable and therefore not 'serious'. The interplay between Hedren and [Suzanne] Pleshette in The Birds tells me more about women than any number of articles on feminist theory. Hitchcock captures the subtleties of females warring with each other; all those nuances of knives and guns conducted in looks and body language. He sculpts the human body in space. And I love the way Hedren handles cigarettes and a martini glass with such remarkable sophistication. It is gesturalism raised to the level of choreography." The Countess From Hong Kong with Marlon Brando and Sophia Loren, directed by Chaplin, in what was to be the "Little Tramp's" final film. The three films, back to back, were an auspicious start for the Minnesota girl of Scandinavian parentage. Between over twenty films and numerous television appearances, she's been involved in a wide variety of humanitarian and environmental causes, almost overshadowing her screen work. As volunteer International Relief Coordinator for "FOOD FOR THE HUNGRY", she traveled worldwide to set up relief programs following earthquakes, hurricanes, famine and war. She aided "boat people" in the South China Sea from a "FOOD FOR THE HUNGRY" rescue ship. Lobbying efforts on behalf of Asian refugees have taken her before Congress and have earned her numerous awards including the "Humanitarian Award" presented to her by the B'hai Faith. She has been honored by the USO for entertaining troops in Vietnam and by the CELEBRITY OUTREACH FOUNDATION for her charitable work. She began her long love affair with wild animals in 1969 while doing a film, Satan's Harvest, in Africa. She "met" a mellow lion, and much of her life since then has been devoted to the big cats. Deeply involved with international conservation groups to save wildlife, and an outspoken voice against cruelty to animals, both wild and domestic, she's a board member of "The Wildlife Safari", founded by her friend, Frank Hart, in Winston, Oregon. She also served on the board of "The Elsa Wild Animal Appeal" founded by her friend, the late Joy Adamson. And currently, she is on the Board of Directors of Earth Communications Office (ECO), and President of the newly-formed "American Sanctuary Association." Her other charity work includes serving on The Board of Directors of The Women's Council of KCET (Channel 28), The Minnesota Film Council, The American Heart Association, The March of Dimes, Multiple Sclerosis, International Orphans, Inc., and several AIDS causes. She has been honored with "The Helen Woodward Animal Center's Annual Humane Award" (1995), the prestigious Founder's Award from the American Society or the Prevention of Cruelty to Animals (1996) and the "Lion and Lamb Award" from Wildhaven (1997) for her work on behalf of animal rights and conservation. Perhaps Tippi Hedren's most unique endeavor is being "den mother" and close friend to sixty-odd big cats - lion, tiger, leopard, cougar, and serval at The Roar Foundation's Shambala Preserve near Acton, California. 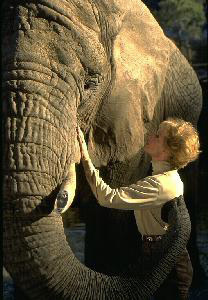 The high desert animal preserve is home to the felines and pachyderms and was first established as an African-type set for the motion picture, Roar, which Tippi co-produced and starred in with her daughter, film actress Melanie Griffith. After the five year filming was completed, it became the current, non-profit center for big cat care and research. In keeping with her outlook on the environment and conservation, many of Shambala's residents are cast-offs from private owners, zoos and circuses. "They're living out their lives in safety and comfort." The Preserve is open to the public on a reservation basis. Tippi is founder and President of The Roar Foundation and resides at Shambala in a cottage surrounded by big cat compounds. "I awaken to their roars." The story of Tippi's life and the animals "dearest to her heart" was told in Simon & Schuster's The Cats of Shambala (1985). Several documentaries have been produced about the Shambala Preserve including, Lions: Kings of the Serengeti by the Richard Diercks Co, Inc. which won the Telly Award in 1995 for outstanding video documentary; and Life With Big Cats (1998), produced for Animal Planet, which won the Genesis Award for best documentary in 1999. Tippi continues to work frequently in motion pictures, theatre, episodic and cable television, and her contributions to world cinema have been honored with Life Achievement awards in France at The Beauvais Film Festival Cinemalia 1994, and in Spain by The Fundacion Municipal De Cine in 1995. In 1999, Tippi was honored as "Woman of Vision" by Women of Film and Video in Washington, D.C., and received the Presidential Medal for her work in film from Hofstra University. And in 2000, Tippi was honored as "Best Actress in a Comedy Short" in the film "Mulligans!" at the Method Fest, Independent Film Festival, and in 2002, Tippi won "best Actress" for the short film "Tea With Grandma" from the New York International Independent Film Festival. Tippi was presented with an Honorary MFA degree in Acting for film from the New York Film Academy in January, 2012. Washington D.C., July 31, 2015 -- Following the tragic and reportedly illegal killing of Cecil the lion, Born Free Foundation and Born Free USA today called on the U.S. Government and European Union to take urgent steps to end the import of lion trophies and for an international moratorium on lion hunting. The global outcry following Cecil’s death has sent shock waves across the world and has further ignited the political and public debate on the plight of wild lions and the inhumane actions of sport hunters. President Barack Obama and Prime Minister David Cameron have made very public declarations to stop the illegal wildlife trade. Born Free is concerned that this may not be implemented fast enough. Current estimates suggest there are barely more than 30,000 lions remaining across Africa and localized or regionalized extinctions in the next decade are a real possibility. Born Free is calling on the United States Fish and Wildlife Service to release its Final Rule on the petition to list the lion as ‘endangered’ under the United States Endangered Species Act, first submitted by Born Free and others in March 2011. Listing under the ESA would prohibit wounding, harming, harassing, killing, or trading in lions, except under certain very limited conditions, and would add significant protection for lions across their range. Further, Born Free is calling on U.S. Government prosecutors to explore whether legal action against Walter Palmer is warranted under the Lacey Act, which prohibits transport of wildlife specimens if they were taken illegally in their place of origin. There is very little evidence that the proceeds of trophy hunting benefits conservation or local communities in the hunting areas, with as little as 3% or less of the revenue generated trickling down. Lions and other charismatic wildlife are worth far more alive than dead to Zimbabwe’s tourism industry. In Zimbabwe it is estimated that trophy hunting generates only 3.2% of total tourism revenue. As further details emerged as to Palmer’s callous actions and how this proud dominant male lion was dismembered, the brutal reality of the business of lion hunting was graphically exposed to the world. The practices of canned hunting operations have also been thrown under the spotlight, with allegations that lions are often drugged and baited to make them easier prey. Fuelled by their sensational appetite for trophies, the demography of hunters, who mainly stem from the U.S., pay thousands of dollars for their kill. Across Africa, lion populations have reduced by more than 50% since 1980, and in much of its range the declines have been far higher. Lions have disappeared altogether from at least 12 African countries, and possibly as many as 16, in recent years and only inhabit a fragmented 8% of their historic range. Cecil was collared and was being monitored as part of a conservation study by WildCRU (Wildlife Conservation and Conservation Research Unit, University of Oxford) - a group supported by Born Free. All the evidence shows that Cecil was illegally pulled out of a national park, where he lived a protected existence, to an area where he could be shot. This illegal act was paid for by Palmer. This lion was left in severe pain for many hours before he was finally shot. Born Free USA is a global leader in animal welfare and wildlife conservation. Through litigation, legislation, and public education, Born Free USA leads vital campaigns against animals in entertainment, exotic “pets,” trapping and fur, and the destructive international wildlife trade. Born Free USA brings to North America the message of “compassionate conservation”—the vision of the United Kingdom-based Born Free Foundation, established in 1984 by Bill Travers and Virginia McKenna, stars of the iconic film Born Free, along with their son, Will Travers. Born Free’s mission is to end suffering of wild animals in captivity, conserve threatened and endangered species, and encourage compassionate conservation globally. More at www.bornfreeusa.org; www.twitter.com/bornfreeusa; and www.facebook.com/bornfreeusa. “We are extremely saddened by the news of Cecil the Lion being illegally killed for sport—not only from an animal welfare perspective, but also for conservation reasons. African lion populations have declined sharply, dropping nearly 60 percent in the last three decades. With as few as 32,000 African lions remaining in the wild, individuals matter for conserving the species. Even worse, the killing of a dominant male in a pride, like Cecil, can have a ripple effect and result in the deaths of other males, young cubs and females in that pride.